There are many eason to learn French. There are numerous reasons why people should study French. Aside from being one of the most popular languages in the world, learning French can be fun! While there are many reasons why people should study French, here is LoveToKnow's top ten! It doesn't matter whether the job for which you are applying requires it, putting that you are fluent in another language on your resume simply looks good. When you show the tenacity to learn another language, it not only says to a perspective employer that you are intelligent, but also versatile. That is why 'looking good on a resume' is one of the top reasons why people should study French. When you speak a foreign language, you open up the possibility of making more money. Why? Because you're offering a skill that's in demand. Consider flight attendants for example: if you speak French and then service flights from the US to France, you can often earn double what your non-Francophone flight attendants are earning. Other jobs as well pay more money for your services when you can assist in translation. The United States does the most trading with our Francophone neighbors to the North. Quebec alone did $72 billion dollars of trading with the United States last year. Among foreign countries doing business in the United States, France employs the largest number of Americans. There are approximately 600,000 Americans working in US Companies, in France. In general, French is the most sought after foreign language in job postings from both the UN and the State Department. French is one of the official working languages of numerous international organizations including: The Red Cross, The United Nations, UNESCO, NATO, OECD, and many others. In a world that's becoming increasingly smaller through the cyber network, it has become crucial that we understand and respect diverse cultures. Studying a foreign language in general will help you gain a different perspective on many historical events, as well as an appreciation for new cultures. Considering that the French language plays a significant role in about 68 countries -- learning French is a good step towards cultural diversity and understanding. French is the most popular second language chosen among students. 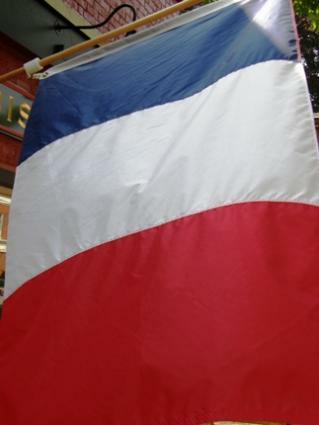 More than 1 million Americans speak French in their homes according to data from the 2000 census. About 129 million people speak French. It is at least one of the official languages in 29 countries. One great benefit of studying French is that it will undoubtedly improve your English. Did you know that there are more French words lent to the English language than any other foreign language? By speaking French, you will undoubtedly improve your vocabulary in English. However, you will also find that by having to work with and define verbs, nouns, subjects of sentences and other grammatical points that you had never thought about, your understanding of English grammar will skyrocket. Colleges love to see foreign language study. In fact, most college admissions requirements dictate at least two years of foreign language study while more selective institutions like to see at least four years of foreign language study. However, there's a hidden benefit that most people don't think about. Studies suggest a strong correlation between years of foreign language study and high test scores. In general, the more you study French, the higher your SAT scores will be. One obvious reason to study French is to communicate with Francophones. With 129 million Francophones worldwide, chances are good that you'll run into someone you can converse with. Canada, which is a bilingual country, is the largest trading partner with the United States. Québec alone (a French speaking province), is does a substantial amount of business with the United States. Reason #10: Studying French is Fun! Last but not least, studying French is just plain fun. Learning about a new culture, and learning a new language broadens your horizons. It's probably the only class you'll take where you can talk all the way through class and its allowed. . .as long as you're speaking French. There's no doubt that studying French will improve your English, enable you to speak to other Francophones, offer you more job opportunities and look good on your resume. Make sure to check out LoveToKnow's articles on how to learn French.